The Toronto Symphony’s “Sci-Fi Spectacular” was nothing less than its name suggests. Yes there were people walking around in costume and Stormtrooper on patrol at Roy Thomson Hall. But it was mostly a night for “fans” to let the music of some of their favourite films take centre stage – Star Wars, Superman, E.T., Close Encounters of the Third Kind. 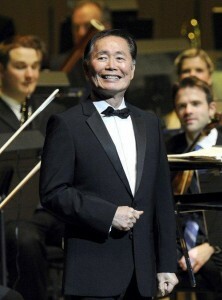 George "Sulu" Takei beams on stage with the TSO. He spoke about how he loved Toronto for its diversity, from Little Italy to Greektown to Chinatown. He spoke about the diversity of Star Trek’s bridge crew and how it was far from the norm in 1966. At the height of the Cold War and U.S. civil rights movement, an African woman and a Russian were among the show’s main characters. At a turbulent time in Asia’s history, his Sulu character was meant to represent all Asians. He also joked that Canadians were “over-represented” given there were two on the Enterprise crew – William “Captain Kirk” Shatner and James “Scotty” Doohan. Just when I thought I knew everything about Star Trek he told the story of how Star Trek creator Gene Roddenberry came up with the name Sulu. Roddenberry didn’t want Sulu to be associated with any specific Asian country or culture. On a map of Asia, Roddenberry stumbled upon the Sulu Sea. As a body of water he decided the Sulu name would be a symbol of Asian unity as waters know no boundaries. Takei also pointed out that Star Trek took place 300 years in the future, but it has only taken us 46 years to go from Gene Roddenberry’s utopian vision to reality. After his remarks, he was joined on stage by soprano Kristen Plumley, who sang beautifully as the TSO performed the famous theme from Star Trek by Alexander Courage. The night was not simply a John Williams fest. We also heard the theme from Somewhere in Time, by John Barry. I must see this movie. And we heard Bernard Hermann’s theme to “The Day the Earth Stood Still.” Indeed, Takei returned to the stage to recite the chilling “final speech” from the 1951 film. And of course it wouldn’t have been a sci-fi night without hearing Also sprach Zarathustra, the music made famous in 2001: A Space Odyssey. Great review of the concert! It was truly out of this world. Hi admin, I’m also interested in this. (Take a look at the latest post on my site for details.) This was a really interesting read, you have definitely given me some food for thought!